What It Is: First off, Happy Mother’s Day y’all! If you’re sitting down for a cuppa with mom today, think about this nifty gift idea for next year (or her birthday, or Christmas). 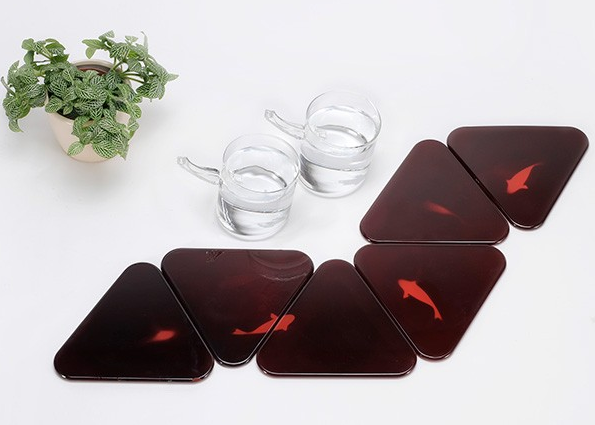 This nifty kit includes two drinking glasses and two ‘drinking pads’ (aka coasters) that allow you to create a school of fish depending on where you place your warmed up beverage. It’s sort of the tea-drinking / coffee-sipping equivalent of a zen garden or koi pond, if you will. You can’t really see it in the photo above, but the handles of the glasses are actually fish-shaped as well. Cute & clever! Who It’s For: Well your mom, as I mentioned, might dig it as an excuse for the two of you to sit and chat at some point. Your best friend would also love it as a housewarming gift. And your coworker will definitely enjoy sharing some office gossip with you over a hot bevvie any time of year. What It Costs: $50 for the set. I really can’t see myself spending $50 on this. A cute idea but too much money for two cups and some coaster I think! I think it’s a very cute idea, but I can’t really think of someone who’d actually appreciate it for that price. I like this ! My girlfriends husband would absolutely love this. I have passed the info on !